The Ford Mustang is one car that needs no introduction. Yet, for sheer joy, I am about to do so. Born in 1964, the Mustang is what popularised the term 'pony car'; it's played a big part in pop culture, making several on-screen appearances: once as Steve McQueen's accomplice in the thriller Bullitt and, another time, as Vanilla Ice's ride in the hit single Ice Ice Baby. Today, over 50 years later, we review the red-blooded 2017 5.0L V8 GT model. This 6th generation Ford Mustang has evolved much, yet it remains distinct, recognisable and oh-so-desirable. It's a tastefully-executed modern interpretation of that 'long hood, short rear deck and fastback roofline' formula. That gaping grille, with sharp squinting eyes, gives it the look of an untamed steed. The light clusters come with a triad of slanted LED stripes that shine through the daytime and add more character to the cutting-edge frontal design. The body that follows is muscular, but not bulky, defined by hood creases that are sharp and pronounced. and they extend over the roof as well - good design is in the details! The 19-inch wheels that came with our test car complement the rest of the fuselage rather well. The rear end, characterised by a triad of lamps on either side - a Mustang signature - has an amazing 3-dimensional effect. The lights are even more amazing when operated, working in sequence when a lane change is indicated. And to complete the rear look are some meaty dual exhausts at the bottom. The 2017 Mustang is one of the more beautiful designs of this decade. So if you want to attract attention or exhibit your love for American muscle, this car comes highly recommended. You can stare at it for hours. We got curious about the interiors, so we opened the long doors - watch out for neighbouring cars - and found a rather simplistic cabin, one with a black colour scheme and a retro vibe, thanks to details like the twin shades over the dashboard, inspired by the cabins of Mustang fighter planes. The seating position is good; it's relaxed but no matter how you adjust yourself using those power adjustable options, your forward vision will be a tad hindered by the sheer length of the hood. it takes some getting used to. But there won't be a problem backing, thanks to the rear camera. The blue-lit dials of the speedo and the tachometer with the silver bezels are a nice touch, and the colour can be adjusted to as many hues as you can imagine. The 3-spoke retro-style steering wheel is the right size, but the wrappings that go on it have an innate plastic feel - acceptable for a base car, not a range topper! This is a 2+2-seater. So, the rear quarters are good for two but not for long hauls, and the bulge in the middle means you can never put a third person back there. Also, getting in or out is not a gracious act. Plus, the electric front seat movers are slow-ish. Soon after viewing the finer points of its visuals, we decided to take it for a spin and pressed that red-circled starter button. The V8 erupted to life and fell to an idle, where it hummed its own tune - a low-frequency rumble. That was a clear indicator of the power that lurks under the hood. Even though this is an all-out muscle car, it bears a sense of civility. It is quiet in its own right, the noises you hear from the exhaust are the ones you like, while the ride comfort is better than some other cars. Forget the V6 and EcoBoost engines, the naturally aspirated 5.0-litre V8 in this GT is the way to go. It may have the smallest displacement of it rivals, the 6.2L Chevy Camaro and 6.4-litre Challenger, but it's just as potent, and lighter too. To be numerically exact, it makes 435 mighty horses - an improvement from the older 5.0L - and some tractor-like 543Nm of torque. That it revs out to 7,000rpm makes this a gem of an engine. While in the city, we gave it some throttle and the GT surged ahead, but the long gearing is evident. But on the open road, bury the throttle and it will thrust forward like a road-munching powerhourse. Worry not, the 60.6-litre fuel tank is enough to keep you going for a while! Expectedly, this was built for the dragstrips and Ford has cleverly equipped it with a line-lock feature. It basically locks the front wheels, while you spin and warm up the rear tyres for additional grip... or you can make it your own smoke machine. If you can get the launch right, you will go from stationary to a ton in well under 5 seconds, while the accompanying exhaust note will enthrall you every time the needle races to the red line. The steering, though, is a work in progress - it doesn't have that "German precision". But it's light in the city and the chassis has great potential thanks to a recalibrated rear suspension and wide tyres. You are always searching for more feel from the steering and your application of the throttle will always have to be deliberate. and that's what makes it fun to drive. While on the move, you shift using the 6-speed gearbox's paddles. It's not as quick as dual clutch transmissions, but is good enough for times when you feel like rowing your own gears. To complement its power of propulsion are brakes borrowed from the superlative 662-horsepower 2014 Shelby GT500. Upfront, you have grabby 6-piston callipers, clamping on large 380mm rotors, and at the rear, single-piston callipers, clamping on 330mm rotors. 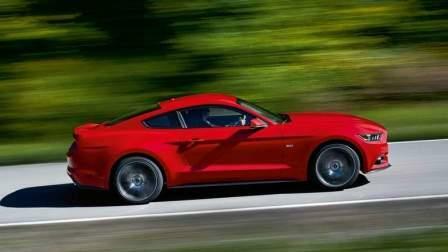 Nobody in their right mind would buy a sportscar seeking practicality, but the Ford Mustang is different. For one, it has a 383-litre boot that will fit a suitcase and then some. Then, you have rear seats that split 50:50 and fold. Only niggle: the boot lid cutout is a tad narrow. The 2017 model comes with SYNC 3 infotainment; it's an ergonomic interface with voice control and a responsive 8-inch screen. It provides full Arabic support - including map, menus and voice guidance. You also get Android Auto, Apple CarPlay and a navigation system with more than 3.5 million POIs with free map updates for five years, and a full dead reckoning support - which means being able to navigate even after the loss of GPS signal. You also get USB ports and Bluetooth as part of the package. During the times we left it out in the sun, the efficient air conditioner turned this fiery furnace into a comfortable cabin. Surprisingly, you also get heated and cooled seats. When you purchase a 2017 Ford Mustang GT, you don't only buy a modern 2-door performance coupe, but a brand with genuine heritage - a piece of history. It's a great daily driver that manages to embody the quintessential muscle car drive and feel, thanks to that sonorous V8. Rear quarter is expectedly tight and the steering wheel wrapping feels plastic. But for those who wish to live the American dream, this is as good as it gets. Do keep in mind, a refreshed 2018 model will be out soon, so you might want to wait!